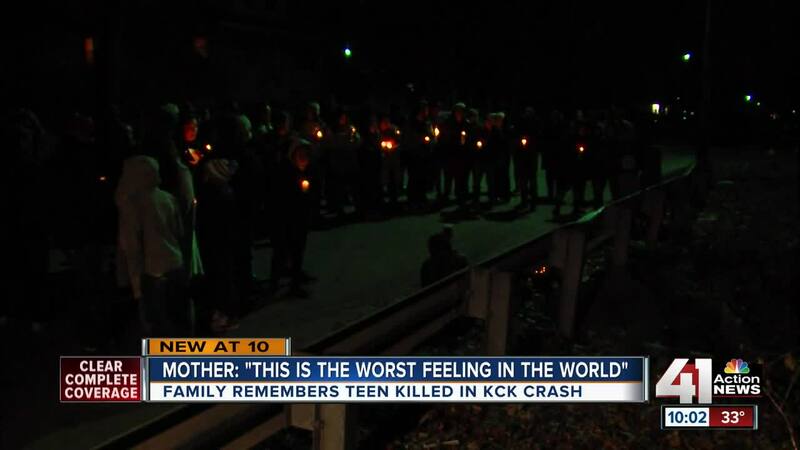 The family of the J.C. Harmon High School freshman who died in crash Thursday organized a vigil Friday evening as way to remember the 14-year-old boy but also to provide his friends and classmates a place to comfort each other during this difficult time. KANSAS CITY, Kan. — The family of the J.C. Harmon High School freshman who died in crash Thursday organized a vigil Friday evening as way to remember the 14-year-old boy but also to provide his friends and classmates a place to comfort each other during this difficult time. They held one another at the site where Angelo G. DePeralta lost his life. DePeralta's mother, Lorena Gonzalez never thought she'd find herself at intersection of South 40th Street and Wyandotte Avenue. Just a day ago, she was waking DePeralta up and sending him off to school. "He comes down 'I'm leaving mom' and said 'ok baby we'll see you later, I love you be careful make good choices,'" Gonzalez said. However a few hours later, a devastating call from her oldest son. "He's like 'mom something is wrong. Angelo got in a car accident, they said he's hurt,'" Gonzalez recalled in an interview with 41 Action News. DePeralta was in the passenger seat of an SUV Thursday when police say the teen driver, one of his friends, lost control, struck a dump truck and guardrail before rolling over. Gonzalez rushed to the scene. "And I see everybody is OK, so in my head I thought he was OK," Gonzalez said. But the J.C. Harmon high school freshman and aspiring baseball player didn't survive his injuries. "Angelo was definitely loved, he has some many friends so much family," Gonzalez said. "His smile would imprinted in your brain forever you could see dimples, he was an all-around good kid." Police said that none of the teens in the SUV wore seat belts at the time of the violent crash. "Kids just need to listen. I told Angelo this all the time - put your seat belt on, put your seat belt on wherever you go--that's the main thing, the most important thing, wear your seatbelt," Gonzalez said. "This probably would have helped him, it would have saved him." The family set up a GoFundMe campaign to help with funeral expenses. A benefit is also planned for Sunday at Reich's Club in KCK from 1 to 7 p.m.